Crème brûlée has long been a favorite restaurant dessert, and it is surprisingly easy to make at home. This Instant Pot version offers an alternative method of cooking the dessert, which is a welcome option if the oven is in use. The Instant Pot is also a good option for a warm summer day because it doesn't heat the kitchen the way a conventional oven does. 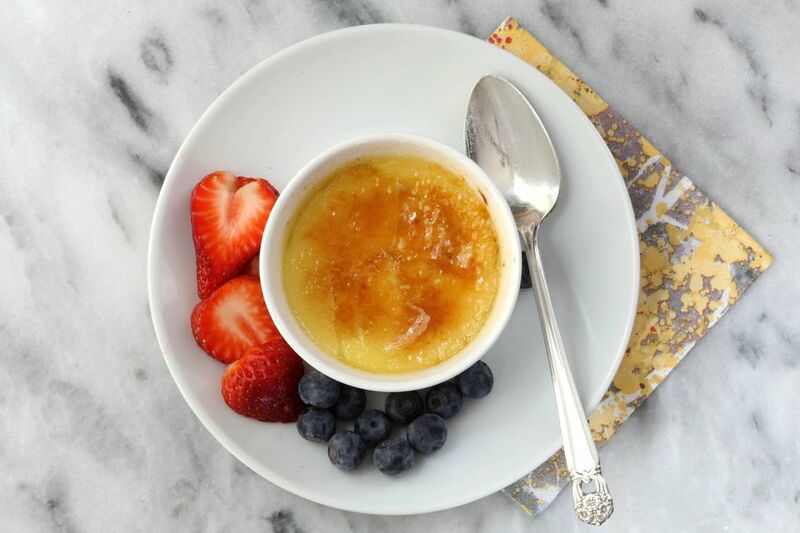 When making crème brûlée, plan on a cooling-down period and a chilling time of at least 3 hours (or up to 3 days). The sugar topping is applied just before serving time. It's the ideal make-ahead dessert! Separate the eggs. Put the yolks in a medium mixing bowl and put the egg whites in a storage bowl. Refrigerate or freeze the egg whites for another use. Add 4 tablespoons of the granulated sugar and the pinch of salt to the bowl with the egg yolks. Whisk until well blended. In a saucepan over medium heat, combine the cream and the remaining 3 tablespoons of granulated sugar. Bring the mixture to a boil over low heat. Slowly whisk about 2/3 cup of the hot cream mixture into the egg yolks. Pour the egg yolk mixture into the saucepan and continue heating for about 3 minutes longer, or until the mixture coats the back of a spoon. Make a path down the back of the spoon. If the liquids don't run into the path, it is ready. Strain the custard mixture through a mesh sieve into a pitcher or measuring cup with a pouring spout. Add the vanilla or vanilla bean paste and stir to blend. Divide the custard among six 5-ounce or 6-ounce ramekins. Cover the ramekins tightly with foil. Pour 1 1/2 cups of water into the Instant Pot and place the trivet in the pot. Arrange the ramekins on the trivet, stacking them as necessary. Lock the lid in place and move the steam release valve to the sealing position. Choose the pressure cook function (high pressure) and set the time for 9 minutes. When the time is up, allow a natural release for 10 minutes and then carefully turn the steam release valve to venting to release the remaining pressure. Or follow your manufacturer's directions for pressure release. Remove the custards to a rack to cool completely, and then move them to a tray and refrigerate them for at least 3 hours, or overnight. Just before serving, remove the custards from the refrigerator and take off the foil. Sprinkle 1 1/2 to 2 teaspoons of extra fine sugar over the top of one custard and swirl it gently to distribute the sugar over the entire surface. Hold a kitchen blowtorch about 2 inches from the surface of the sugar and move it in a circular motion while turning the ramekin until the sugar is caramelized. Be careful when turning or moving the ramekin; the edges will be quite hot from the flame. Serve the crème brûlée plain or add some berries or mint leaves for a spectacular presentation. While regular granulated sugar can be used, superfine sugar is the best choice, as it caramelizes quickly. Many people swear by raw or turbinado sugar. A blowtorch, whether the small culinary kind or a larger hardware store torch, can do more than burn sugar on crème brûlée. Use a torch to put a char on steaks, chops, and peppers, or add browned peaks to a baked meringue. It's also a quick way to toast breadcrumbs or a cheese topping.